Here we are on Monday again and I've got more bits 'n' pieces for you! On Saturday, I took my mom to a Mother's Day Tea at the Octagon House in Washington Township, Michigan. 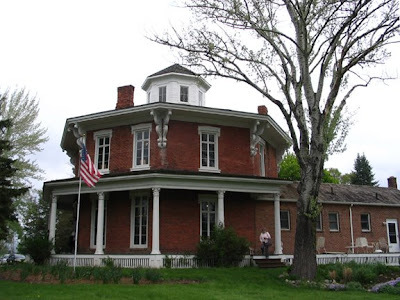 The house was built by Loren Andrus between 1858 and 1860 in Italianate style. Apparently five men in the area had a bet going as to who could build the most unique house, and Andrus won! (The bit to the side was added later, by another owner.) It had a cool winding staircase that led way up to a cupola with windows on all sides, which had a nice view of flowering spring trees and shrubs. 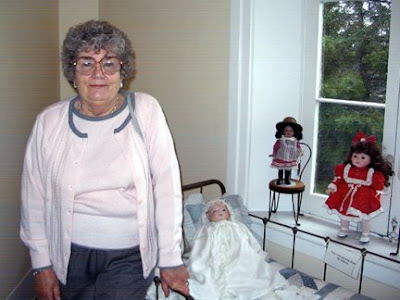 Yep, that's my mom in one of the children's bedrooms. (For a little game, can you guess how old she is? I think she looks a lot younger than she is, but because she's my mom, I may be biased!) For more photos of the home, click here. The tea itself consisted of tea (amazingly enough), scones with Devonshire cream and jam, tiny quiches, finger sandwiches, and little desert tidbits. My favorite was a tiny chocolate cup filled with chocolate mousse and topped with a viola petal! (Nom nom nom.) On June 19, they're hosting a Mid-summer Night's Faerie Tea, which sounds right up my alley, so to speak. ...and this equally cute squirrel corn (Dicentra canadensis). Its prefect place, in case you're wondering, is between a good-sized red twig dogwood (Cornus sericea) and this dwarf fothergilla (Fothergilla gardenii), which is blooming its heart out. It, too, is in its second location, the first not having been sunny enough. Ha! And finally, I'm happy to steal Esther's wonderful idea participate in Esther's Monday Maths. Which I don't think was intended as a meme, but I liked the idea so much, I asked her if I could try it, too! (She said yes.) I used to be quite handy with scissors and paper, but I'm out of practice. Oh I'm thinking of cakes and chocolate now!!! Sounds like a lovely place you visited with your mum. Will you be posting about the Mid-summer Night's Faerie Tea? Some venues here do Teddy Bears' picnics - I'll have to suggest a Faerie Tea to them! Trilliums always look magical to me. That house looks way cool and Happy Mother's Day to you mother! She looks most happy. Tea and scones sound really good. Fun post Monica! I love the house, sounds like you and your Mom had a great time. She looks like she was enjoying herself. That's a very nice-looking Pieris specimen. I had one of those at my last house - loved it! Pretty natives! The fothergilla looks very pretty. Like an elegant bottle brush! 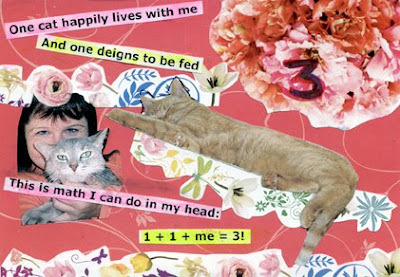 And so glad you've done a mathematical collage. Calculus next week? Love those old house with all their extravagances. We had a similar restaurant but it fell victim to the economy. I've never seen a trillium with huge white blooms. Didn't realize there were so many species. 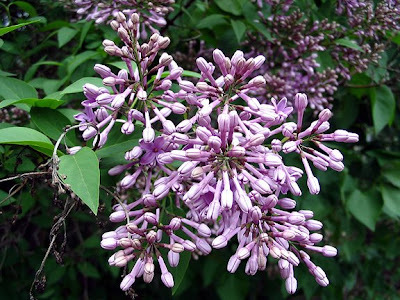 Lilacs are just beginning to bloom here too. Your Lilac is a bit ahead of mine. Did you know it's telling you that it's time to go out Morel hunting? That house certainly is unusual, I've never seen one like it. Pieris japonica x floribunda 'Mountain Fire' is gorgeous! That sounds like a scrumptious tea you had with your Mom. What a lovely way to celebrate Mother's Day! I love your new additions, can't wait to see their new homes as soon as you get everything moved about. ;) I do the same thing, the twister bit, lol. Love the Mish Mash Monday meme! I am so glad you and your mum had tea and an outing for Mother's Day! The house and the spiral staircase to the spring view sounds like a good place to visit...exactly the way my mom would have loved spring...through a window! What a fun day, Monica. You are so lucky ... your mother looks so young and perky! I'm enjoying my daughter's lilacs, a bouquet cut from her garden on Mother's Day. I have lots of red twig dogwood (Cornus sericea) at the lake and 3 dwarf fothergilla (Fothergilla gardenii) surrounding my Kousa dogwood in the bed by the front sidewalk. More white in the front yard (looks good with the sea of pachysandra surrounding my old hay colored house/cranberry door) ... my dogwood is in bloom and white azaleas. What an interesting place to have tea; the Mid-summer Night's Tea sounds perfect, Monica! I, too, have often played Twister trying to stuff one more plant in an overcrowded front garden:) I'm usually thankful when I manage to stay upright and not land on a rosebush by mistake. I'm really enjoying your mish-mash Mondays, Monica; perhaps when things slow down here a little, I'll join you. Love the collage! Monica what a wonderful idea! A mish and a mash of this and that! Great idea for a post..you may have started a trend!! What a wonderful day spent w/ your mom!! My ears are perking up w/ hearing about the mid summer tea!! Hummm...should I take the time and come for that one...just a few hours from me!! Crossing the border of course. Have a wonderful week enjoying your garden! Happy Birthday to your Mom! I live in an octagon house but not two stories and not so palatial. What a nice birthday celebration for your Mom. I am guessing 39 for the 30th time.